Criminal damage at the office of Tony McLoughlin this morning. 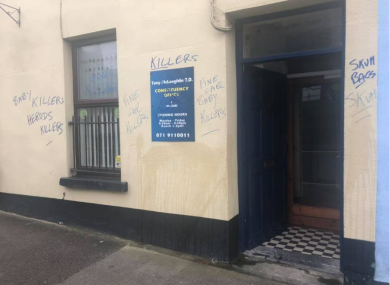 A GARDA INVESTIGATION has been launched after a Fine Gael TD’s constituency office was daubed in anti-abortion graffiti overnight. The attack on Tony McLoughlin’s Sligo office came after abortion legislation passed in the Seanad yesterday, paving the way for the legalisation of the termination of pregnancies in Ireland. Staff at McLoughlin’s office arrived to work this morning find the exterior of the building covered in anti-abortion slogans, including “scumbags”, “Fine Gael killers”, and “Herod’s killers”, as well as urine and faeces. Speaking to TheJournal.ie, McLoughlin hit out at those responsible and called on them to respect the passing of May’s landmark referendum to repeal the 8th Amendment. McLoughlin also commended gardaí for their response to the incident, while a garda spokeswoman confirmed investigations into the incident were ongoing. “Gardai are investigating criminal damage to an office on John Street, Sligo that is believed to have happened overnight [on] Friday 14 December 2018,” a statement said. Email “'It's very disappointing': Garda probe launched as TD's office covered in urine and anti-abortion graffiti”. Feedback on “'It's very disappointing': Garda probe launched as TD's office covered in urine and anti-abortion graffiti”.